I ended up flying a lot during my trip back to the States. Since I have family members all over the country, and friends that I hadn’t seen in a long time as well, I ended up flying from LA to Portland, from Portland to Oakland, from Oakland to Boulder, and then finally back to LA. I used to love flying when I was a kid, but flying has lost practically all its glamour, as far as I’m concerned — especially with the length of time one has to spend in security lines these days. In fact, I seriously thought of using the train to get from destination to destination while I was back in the States, even after taking my abysmal Amtrak Coast Starliner experience into account. I like the idea of slow traveling, of letting the process of travel play itself out across time so that there is actually an experience of distance and difference. I also much prefer trains to planes because you can get up and walk around on a train, and people tend to be more social as well. (Airplane seating is the apotheosis of cramped isolation.) A boat trip might even be better — allowing you time to read and watch waves and weather patterns, and realize that there is a vastness between places. one of the conclusions i have reached by doing this record is how something fairly radical had to change in my own life. it was going to be difficult to criticise apples being flown from new zealand to england all year round if i was then taking flights myself every weekend. i have therefore decided to stop flying on environmental grounds. since i have family in america, i will allow myself one flight a year. for everything else though, i will be travelling by bus, boat and train. when it comes to touring i will be away for 4 months of the year and then spend the remaining 8, working on music. after flying at least once a week for 10 years, i will also be delighted to leave the pitifully uninspired vision of the world presented to us by airllines and airports: a constant barrage of adverts for swiss watches, luxury resorts, executive golf magazines and cosmetics. it will also mean longer visits to each country and an opportunity to understand more of the local cultures we visit and to appreciate the lost art of travel. a part of the rising slow movement. I too am planning on trying to limit my flights back to the States to once a year, and on this trip I had even wanted to eliminate flying within the States. However, since my vacation time was short, I had to resort to the flying can. Of course, one of the reasons that I had to resort to traveling by plane in the end is that there is no high-speed rail to speak of in the United States. In Japan on the other hand, the shinkansen may be a bit expensive, but it certainly is pleasant. I can get from Osaka to Tokyo in just about 2.5 hours, I have legroom to spare, and it’s easy to get a window seat if what you like to do is watch the countryside go by. There’s no security wait, and you can bring whatever delicious foods you like to eat onto the train with you. Perfectly civilized. Of course, one of the things that is absolutely fantastic about plane travel is the ability to cloud gaze at the level of the cirrostratus and the cirrocumulus. I like watching the shell of the Earth’s moisture, just at the line where space starts to touch down and let itself be known. 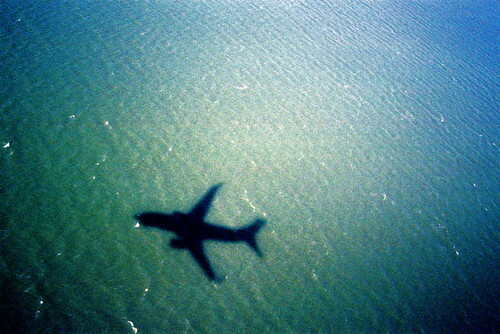 The truism that the increasing speed and ease of travel has made the world smaller is correct in two senses. On the one hand, there is the obvious sense that distances decrease. The 11 hour flight from Osaka to California is easy, takes half a day, and assuming you’ve timed it right, you can get off the plane without too much jet lag and immediately start enjoying your new style of space. But if you spend enough time gazing out of the window onto the habitations below, and the green of the natural landscape, you begin to realize the world is small in another sense. On the vertical plane, humanity inhabits a very thin layer. 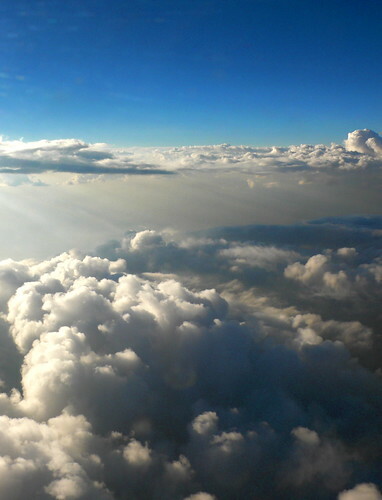 Seen from the air, this layer looks as delicate and temporal as the thin layer of powder on a piece of Turkish Delight. I think the fact that people aren’t more worried about global warming, overbuilding, and environmental destruction has at least partially to do with the fact that no one seems to look out of windows anymore. Our layer is delicate, and small, and except on rare occasions it all takes place less than 100 meters above the surface of the lithosphere. 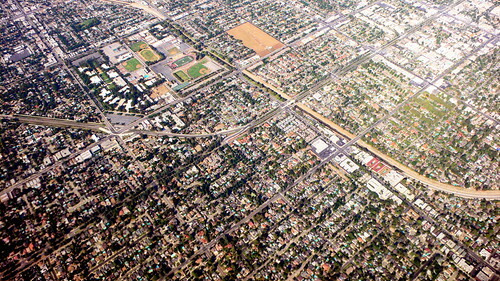 Of course, I’m not trying to blame all of this on Burbank, which is the city pictured in the photograph above. Burbank, for the most part, has respectably sized houses and the McMansions that have become the blight of the last decade’s housing boom in the U.S. are mostly nowhere to be seen. However, Burbank is still a good example of the kind of sprawl that needs to be done away with to save wild spaces, and to halt the expansion of our unhealthy reliance on shopping centers and the automobile. Of course, Burbank is a really nice place to live — mostly because the houses were built at a time when suburban homes were still constructed with some kind of eye to build quality and to quality of life. Why someone would want to live in the tindershacks of a contemporary suburb — hastily built mortgage traps — is beyond me. 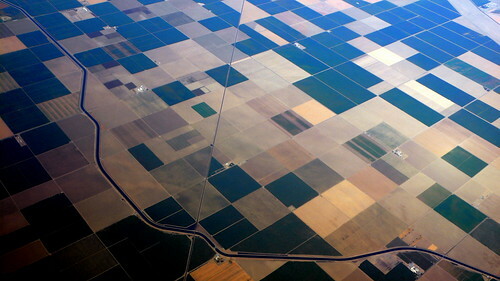 This is a view of California’s Central Valley, one of the most agriculturally productive areas of the planet. Unfortunately, because the price of land has reached such astronomical levels in California, the fields that produce the food-wealth that has been one of the defining elements of the California lifestyle are being paved over. It’s true that the productivity of the Valley is predicated on borrowed water, but the soil itself is naturally rich and the climate is perfectly suited for growing an incredibly wide variety of crops (kind of like Summer Isle). Produce that used to be grown in the Central Valley is now grown elsewhere in the world and trucked great distances to California’s kitchen tables. 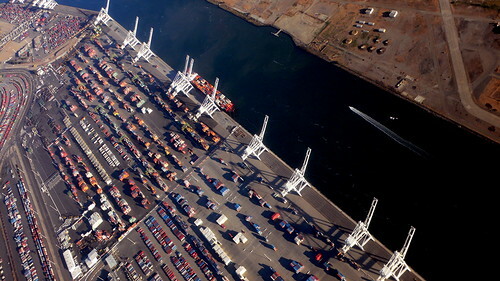 Here’s an aerial view of the Oakland docks, where hundreds of container ships arrive each week. The container ship is a marvel of modern engineering, and shipping via container has become so efficient that shipping expenses account for less than 1% of the cost of any import. Unfortunately, the efficiency of this system also encourages the worldwide spread of sweatshop labor and a global economy based on a system of unnecessary imports and exports. In fact, it’s easy to think of container ships as simply the ultimate extension of the factory — a ceaselessly humming shop floor that extends out into the oceans themselves. War supplies also get sent through shipping ports, a fact that was driven home during the swift, brutal, and completely unwarranted suppression of a peaceful anti-war protest that I took part in at the Oakland docks on April 7, 2003. My personal vision of proper container shipping involves vast, computer-controlled sails. And my vision of international travel includes oceanliners with sails (or perhaps the return of the dirigible!). Let’s add international travel to the list of things that might be included in the Slow Life movement. And let’s add Freitag to the list of companies that are doing interesting things with the detritus of shipping, including opening up a storefront built entirely out of unused shipping containers. 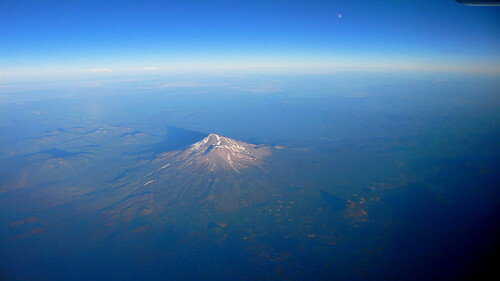 Here’s beautiful Shasta, peeking out of the smoke-induced haze that was covering California and Oregon during my flight to Portland. The source of the haze was a series of Oregon wildfires that had, apparently, been burning for days (if not weeks). 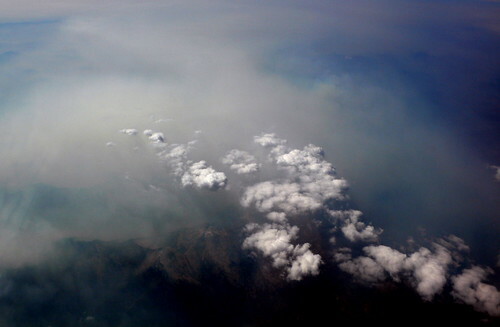 Seeing the wildfires from the air changed my perceptions on the ground once I landed in Portland. The incredible orange-purple sunset that had settled around the city was a different sunset than the one I would have seen had I not realized that the vibrancy of the colors in the night sky was the peak of a pyre burning hundreds of miles south. 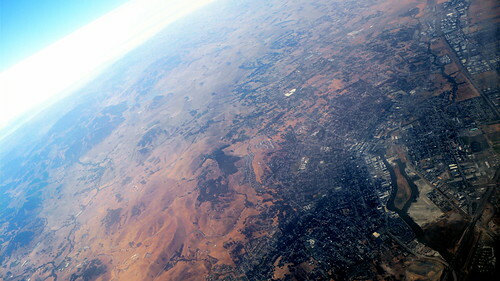 On the way back from Portland the plane flew right over Petaluma, the town that I practically grew up in. I could see the Petaluma River, Petaluma High School, and even the hills out in the country that I used to go hiking around in when I was a kid living out on Eastman Lane. If you’re extremely curious, you can find the satelite imagery here. 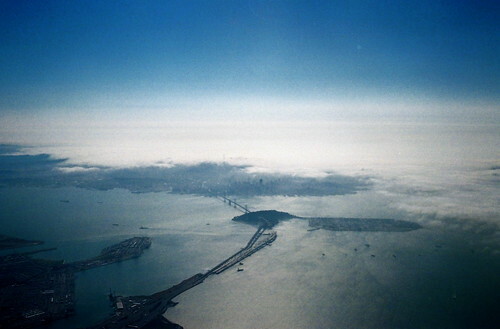 Here’s the fog, moving in to cloak San Francisco. The Las Vegas airport was a miserable place. I was surrounded with the constant sound of slot machines and, even worse, hordes of people with Bluetooth earpieces stuck in their heads, rambling on and on, all around. I can’t believe the popularity of the Bluetooth earpieces and their horrible blinking blue LEDs. Aren’t people aware that these things make them look like the Borg? In Japan, almost everybody sends text messages to each other via their mobile phones instead of talking, so there’s no place for superfluous ear ‘bling’ to tack onto the side of your face. People also tend to keep their ringers off and their phones in their bags or purses, so there’s a wonderful silence that surrounds mobile use in Japan. 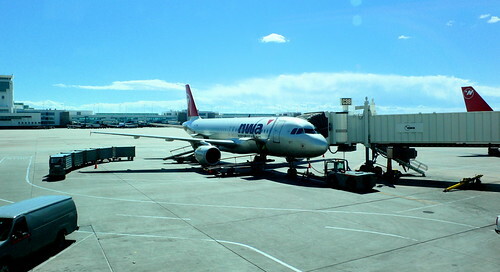 Of course, I’m probably just bitter because all of my connecting flights in Vegas were late, so I had to wait there for an extended period of time. And on top of all that, they misplaced my luggage going in one direction. 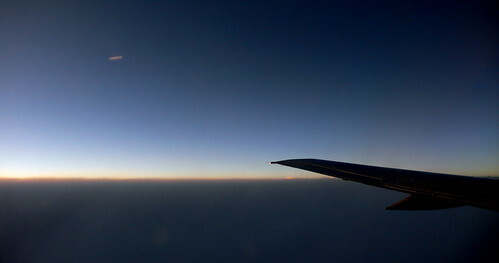 And doesn’t the plane in the photograph above look kind of like a toothpaste tube that’s about to be filled with human?